Welcome all beautiful souls.. ready to take your Meditation to a whole new level? I lovingly invite you to attend a very beautiful and loving Angelic Chakra Meditation Practice which will teach you to attune into each of your energy centres (Chakra centres) to clear balance and harmonise your energy flow on all levels of your being and reconnect you with loving guidance.
" When our Chakras are balanced we begin to resonate all levels of our being in total harmony "
This Meditation series has been designed to work through each of the 12 major Chakras over a 12 week period, thereby giving you all the tools, techniques and guidance to tap into your own Energy flow to bring a deep inner connection of peace love and harmony. The series will include the associated master crystals, color and sound, geometric shapes, Affirmations, and the core element each Chakra consists of and the DNA light codes associated at each level. Meditation develops self-confidence, increases awareness, influences happy mood and behaviour. Meditation develops will power and creates the urge for better situations, happier environments, healthier conditions, giving you the opportunity to create a balanced happier life. Your mental state will begin to relax and unwind allowing you to manage your energy and challenging situations with ease and grace. You begin to create a greater sense of well-being in life - work - home - balance. Our Chakras are our doorway to our intuitive centres (our soul, our connection) and when these centres are out of balance > we can feel irritable, unhappy, sad, frustrated, bitter or angry. We may even feel depressed, or feel that we are alone on this planet and that no one really hears us or understands us. When our energy centres are Aligned > we regain our centre of gravity, we feel alive, bright, excited, joyful, energised, youthful, happy and in balance. We are aligned and follow our intution and guidance, which leads us to success and a far brighter future. Who is this ideally suited for? The Angelic Chakra Mediation practice is ideally suited to anyone seeking to learn more about their energy centres (Chakras) and for those who already have their own meditation practice and who are looking to take this to the next level. Learn how important the Chakra energy centres are to your well-being and spiritual growth; to enhance your energy flow and maintain balance between your mental, physical, emotional and spiritual states. I recommend if you can join the group from week 1 where possible as I will cover a Chakra each week and this will to lay the foundation for your learning. The first 3 Chakras are an integral part of developing your understanding and connection to ground your energy into the earth. Equally important is the association of the lower Chakras to the higher energy centres and their role in ascension and harmonising all levels. 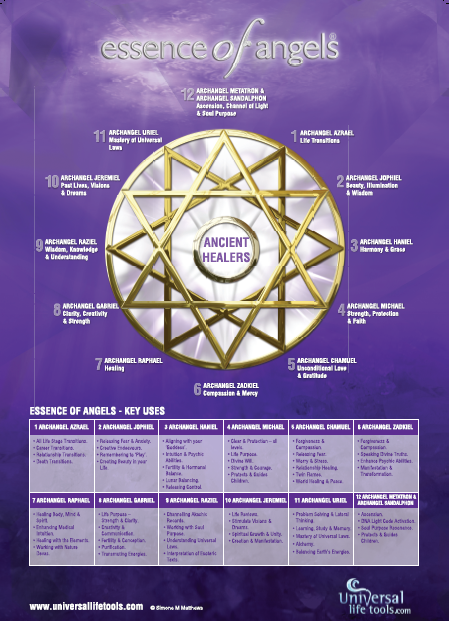 You will discover 12 major Chakras and the Sacred Elements of Creation - The Archangel frequencies. 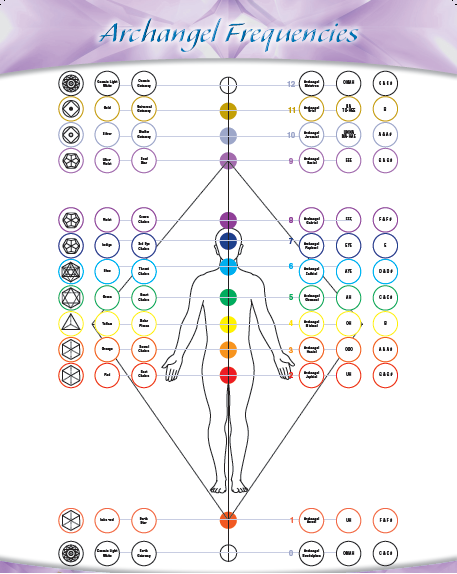 You may be familiar with the 7 key Chakras which we will cover eg. the Base Chakra, Sacral Chakra, Solar Plexus, Heart Chakra, Throat Chakra, Third Eye, and Crown Chakra. You will also discover 5 other major Chakras which are very important to understanding your role here on Earth, the importance of grounding yourself to the Earth energy and the role and significance of your higher Chakra centres and gateways. It’s a really important and beautiful journey at this time! This practice includes information on the Color, Sound and Sacred shapes associated with each chakra, the DNA Light Codes, an activation Affirmation, selection of Master Crystals, the Vibrational Essences and the governing Archangel for each Chakra centre. 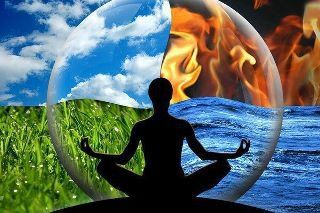 Why is it important to Balance and Harmonise our Chakras? Your Chakras are spinning wheels of energy, a vortex of light and if these centres are not cleared and balanced regularly your energy will be scattered and you will feel out of sorts and unbalanced. ♠ Ever feel like you cannot wake up in the mornings, feel sluggish, groggy or fatigued? ♠ Ever feel de-motivated or like a couch potato? ♠ Ever feel light headed and dizzy, bit airy and not really with it? ♠ Ever feel stressed, nervous, anxious or feel at loose ends? ♠ Do you have difficulty completing your projects? ♠ Feel like a workaholic, obsessed and always wanting more? ♠ Experience heartburn or insomnia on a regular basis? ♠ Ever feel fearful about not having your needs met – such as not enough money, food or income? ♠ Ever experience anaemia, hay-fever, weight-gain, poor digestion, kidney or bladder problems? ♠ Perhaps you feel stressed or worried about your physical appearance, your lack of creativity, or you experience hormonal problems? These are just to name a few of the symptoms that you can experience when you have deficient or excess Chakra energy. Many good reasons to begin having an awareness of our Chakra centres and begin to balance and clear our Centres to bring in more light more happiness and energy into our bodies thereby creating a fulfilling and joyful life experience. When our Chakras are balanced we begin to resonate all levels of our being in total harmony with all of Creation - the oneness! What can you Achieve from the Chakra Meditation evenings? What will you learn from this experience? Your guides can assist you with healing, remembering information, finding lost items, guiding you to your Life purpose, bringing old wisdoms into your conscious awareness; sending you love and guidance and much much more. I am really excited to have you join me on this Angelic Chakra Meditation journey and honoured to be sharing this divine wisdom and information to assist you on your own journey to light and LOVE. I wish you a beautiful loving experience on this journey of exploration, excitement and joy!. Love and blessings on your journey! If you would please read the Important information below for your arrival to assist with ease of finding the property! Namaste. Parking: Free Street Parking is available along John Street. Classes: Can you please arrive by 7.15pm to avoid interruptions thank u. If you are delayed, please text me. On Arrival: Please use the entrance to 10-14 John St and dial 3103 from the Intercom and press Bell button. I will buzz you in. Take the lift to Level 1, exit to the right, walk down the hallway, first door on your right is C103. Water: You may wish to bring bottled water. Cushions: Cushions will be provided for your comfort if you wish to bring your own please feel free. Trains: John Street Is only a 3 minute walk from/to Mascot station. Arriving into Mascot exit left at street level walk to the corner - John Street - turn left and walk approx 1-2 minutes to 10-14 John St - building is on the left. Q & A time: Please feel free to ask questions at the end of the Class I will be available to answer any questions you may have. I wish you a joyful loving experience on this journey of exploration, peace and harmony!.